that I have ever happened to come across!! I have to share it with you!!! And I certainly hope that you will all take the time to enter as well!! How sweet of you to highlight Lynda's awesome blog hop and her wonderful blog! I have enjoyed getting to know Lynda through blogging and I "heart" her creative and fun blog hops! She is a great friend who inspires me and so many others! It's an honor to have "met" her and I look forward to her blog posts. I'm glad I have "met" you through Lynda's blog hop and the No Ordinary Blog Hop I co-host with Lynda and Anna-Marie! I look forward to following you! Wow that hop looks cool..We'll check it out! Hi Steph, Thanks for coming by my blog. I hope you do come back. I am enjoying yours... Looks like you are finding lots of good blogs. There are MANY out there for sure.. 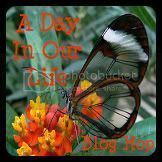 I love this blog hop, I am not sure I could write about a day in my life? ?